2018 New Year in New York! For New Year's Eve 2017-18, you can choose between fireworks in Brooklyn's centrally located Prospect Park, a midnight seaside fireworks display in Coney Island, or a walk across the Brooklyn Bridge. Grand Army Plaza, located at the main entrance to Prospect Park, will be a major viewing site for the Prospect Park fireworks, which are shot off in the Great Lawn section of the park. For a good spot, arrive early. Events: 11:00 p.m.–12:30 a.m.: Entertainment and hot refreshments at Grand Army Plaza. Option A : Take #2 or the #3 subway to the Grand Army Plaza Station. Proceed up Flatbush Avenue (it's a slight uphill, in case you aren't sure which way to go) or follow Plaza Street until you see a very large monument and traffic circle, both of which are called Grand Army Plaza. Option B : Take the Q or B to the 7th Avenue Station. Follow Flatbush Avenue up the hill. Grand Army Plaza is about 3 blocks away. Option C : Catch an F or G train to the 9th Street and 7th Avenue stop, which is about three quarters of a mile away from Grand Army Plaza. However, you can see the fireworks from along the way, so you don't have to walk the entire distance to Grand Army Plaza. Or, take the same trains, the F or G, to the 15th Street Prospect Park Station. From here, you can walk into the park, following signs "to the bandshell," and watch from anywhere either on the park roadway or on the grass. And, if you don't mind walking, there are a few other stations slightly further away. Option D : Take the N or R train to the Union Street station, and walk from 4th Avenue straight up to Grand Army Plaza, under a 15-minute walk. Option E : Take any train (or the LIRR) to Atlantic Avenue subway station, and walk or take a bus up Flatbush Avenue. Parking can be tough in certain neighborhoods in Brooklyn, and Park Slope is one of them. Visitors can search for street parking in and around Grand Army Plaza, from 4th Avenue in to Prospect Park West in Park Slope, along the residential blocks that are within walking distance of Prospect Park. Or, try Prospect Heights, between Vanderbilt Avenue and Flatbush Avenue. The biggest parking garage in the area is Central Parking on Union Street between Sixth and Seventh Avenue, a ten-minute walk to Grand Army Plaza. Several others listed on Google are quite small and many spaces are reserved for local monthly customers who regularly park there. So, parking can be tough. If you plan on driving to see the fireworks, try to arrive in the neighborhood early. Better yet, rely on mass transit for a safe New Year's Eve. Finally, it might be tough to nab a cab, but not impossible. List of 100 Car Services in 20 Brooklyn Neighborhoods. At 11 P.M. attend the free pre-party at Grand Army Plaza, with entertainment, and some light refreshments. Take a 3-mile, almost-midnight run in Prospect Park, finishing near the viewing spot for the fireworks. Go see The Nutcracker at Brooklyn Academy of Music. Park Slope has multiple bars and venues with New Year's Eve events. Nearby, you can visit some small neighborhood places in Prospect Heights. On the street, along Prospect Park West between Grand Army Plaza and 9th Street. Rather spend New Year's Eve at the beach instead of the park? You can see a midnight fireworks display at Coney Island. Spend New Year's Eve on the iconic Coney Island Boardwalk. Luna Park will host their 4th annual fireworks display. The celebration starts at 6pm, past events included extended hours at the New York Aquarium and free rides of the Wonder Wheel. 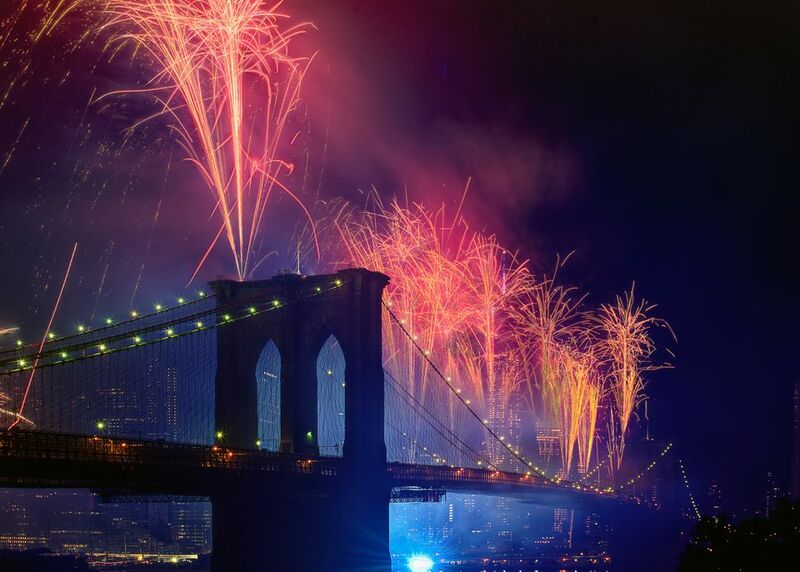 Spend New Year's Eve walking across the Brooklyn Bridge. Walk across the historic bridge taking in the views and fireworks at midnight.